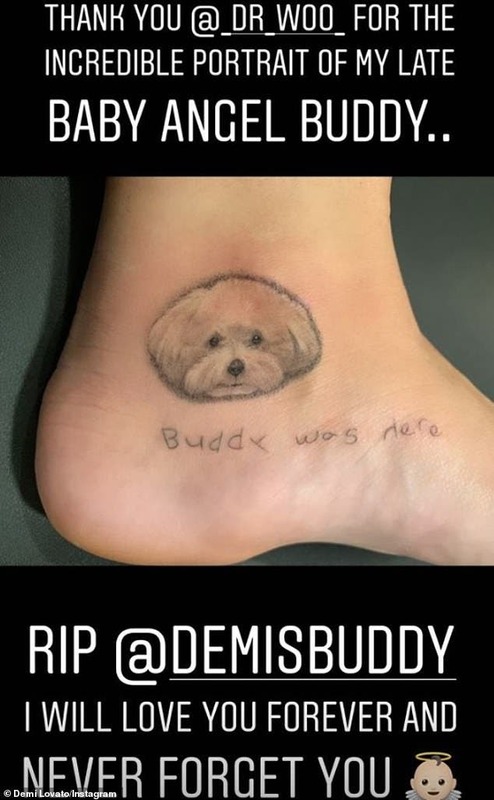 Demi Lovato has had a foot tattoo applied of her late dog Buddy, who died under 'tragic' circumstances in 2015. The 26-year-old singer posted an Insta Stories photo Wednesday of the body art, which featured a likeness of Buddy's face and the text: 'Buddy was here'. She informed her nearly 71 million Instagram followers that she had gotten the ink from tattoo artist to the stars Brian Woo, known as Dr. Woo. Dr. Woo has plied his trade for a wide array of celebrities including Drake, Miley Cyrus, Bella Thorne, Zoe Kravitz, Ariel Winter and Emilia Clarke. This past weekend, Demi's team presented her with a cake to celebrate six months of sobriety after her apparent overdose last July. 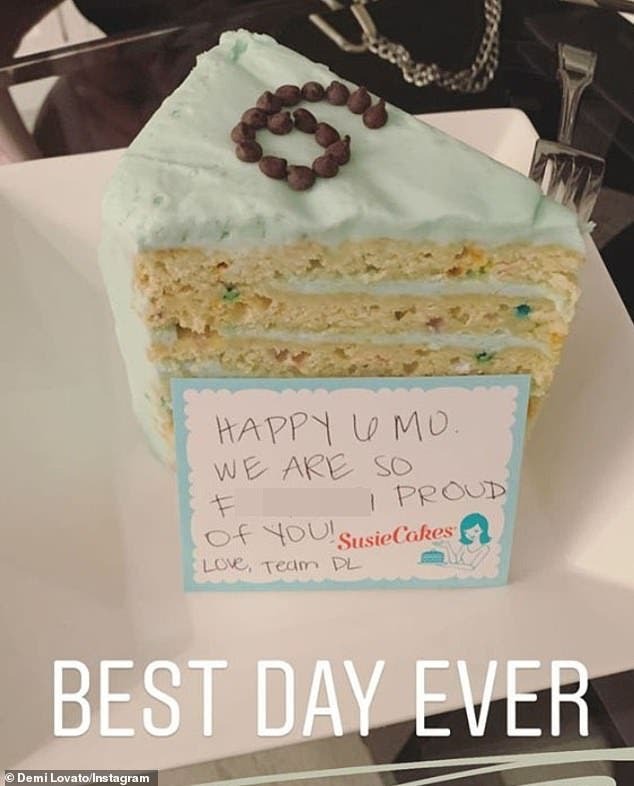 Her Funfetti dessert from Susiecakes was accompanied by the message: 'HAPPY 6 MO WE ARE SO F***ING PROUD Of YOU,' as seen on her Insta Stories. Demi, who has been dating her sober companion Henri Levy, also treated her social media following to a picture of her six-month chip. Henri - who among other places attended priciest boarding school on Earth, the Institut Le Rosey in Switzerland, according to Complex - started the fashion line Enfants Riches Deprimes, which means Depressed Rich Kids. Emergency services arrived at Demi's home late in the morning of July 24 and brought her to the hospital after she suffered a heroin overdose, TMZ alleged. After her arrival at the hospital, a nurse there informed law enforcement that Demi had at some recent juncture taken methamphetamine, The Blast reported. That website's insiders also insisted Demi had not in fact overdosed on heroin. TMZ claimed she partied through the night before she was hospitalized, including at a birthday bash at the bar and restaurant Saddle Ranch for a backup dancer of hers. In a single called Sober, dropped last June, Demi revealed her six-year sobriety had ended and pleaded for her parents' forgiveness.